Labour market participation, the proportion of a country’s population that is either working or actively looking for a job, seems like a boring statistical constant. In advanced economies it has hardly changed in recent decades. But the latest IMF World Economic Outlook devotes a chapter to labour market participation, and it is a key to understanding current US monetary policy. It is sometimes said that economic growth depends on the “three Ps”: productivity, population, and participation. The overall participation rate may not have changed much, but the combination of ageing populations, social change, higher educational attainments, the business cycle, and rapid technological development has substantially altered the components that make up the aggregate figure. Men have been dropping out of the labour force, offset in the aggregate figures by increased participation by women. Variation between individual countries’ rates (shown by the shaded areas) has narrowed over time, especially for women’s participation. 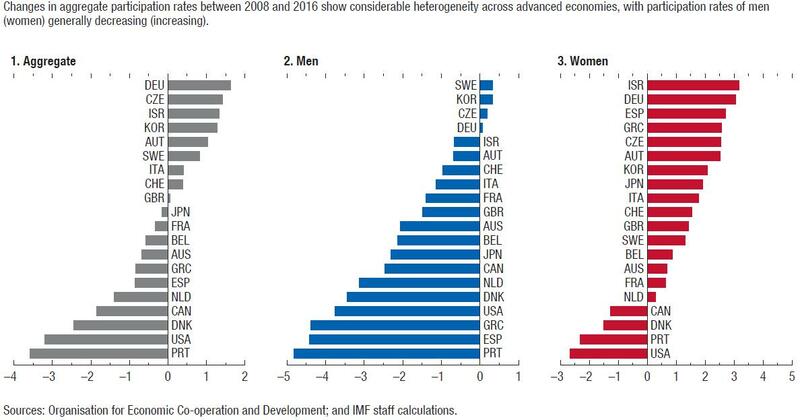 This might seem to be a universal social trend, but in fact there are big differences between countries, with participation holding up for both men and women in Germany, Sweden, and South Korea, while rates for both fell in the US and Canada. Japan and Australia followed the more typical trend, with men’s participation falling and women’s rising. Further disaggregation shows a drop in participation of the younger population (15–24 year-olds), with many spending more time in study. Participation by older workers (especially the 55–64 cohort), particularly women, has risen strongly. The divergences between countries and characteristic differences at the two ends of the age spectrum suggest that outcomes are amenable to policy action. Greater participation by women, for example, reflects family-friendly policies, as well as social trends and wider educational attainment. Those who are marginally attached to the labour force (usually the young and the old) are more likely to respond to financial incentives such as tax/benefits interaction. Getting more of the population into the labour market (and into employment) is not only good for GDP, but also contributes to how satisfied people are with their lives. The dismal story of America’s falling longevity among older white men has multiple causes, but the absence of satisfactory work opportunities is one important factor in these “deaths of despair”. In addition to influencing longer-term economic growth, participation is a key factor in current monetary-policy deliberations. The US debate illustrates the issues, and the same considerations are relevant in Europe. How does the Federal Reserve know when to tighten policy to keep inflation in check? The headline rate of unemployment has fallen to 4.1%, which many would consider to be below “full employment”. Why is the Fed still on a gradual path to normalising policy if the economy is already running at full capacity? The 2008 recession and subsequent slow recovery not only put people out of work, but discouraged some to the point that they dropped out of the labour force altogether – no longer actively looking for work, so no longer counted as unemployed. The recovery has, however, lured some of these discouraged workers back into the labour force. If this process has further to go, the Fed should maintain its accomodative policy stance. But how can the Fed tell how much of the 3-percentage-points fall in participation since 2007 reflects changing age composition, as the baby boomers reached retirement age? These (and other compositional factors) are not responsive to monetary-policy action. 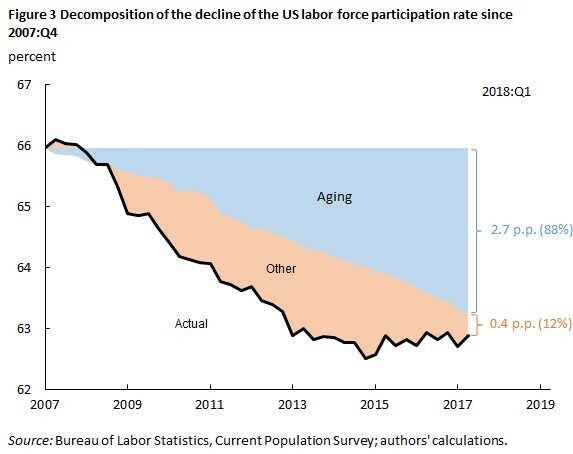 The graph below decomposes the fall in US participation since 2007 into two parts: the blue area shows the fall in participation that can be explained solely in terms of age-composition changes, assuming that 2007 participation rates for each of the component groups remained unchanged. The residual, the pink area, might be attributed to cyclical effects. It looks like most of the cyclical fall in participation has been recovered, which would suggest that the labour market is tight, with little prospect of encouraging more non-participants into work. But steady GDP growth and appropriate policy measures could bring in more young workers (some have been studying because they can’t find a suitable job), encourage more older workers to stay in employment, and reverse the atypical fall in women’s participation in the US. Women’s participation rose strongly after the Second World War. These additional workers added 14% to GDP in the three decades after 1970. But women’s participation peaked in 2000 and is now lower than in 1970: for 25–54 year-olds, it has fallen from 77.3% to 75.2%. Japan, usually associated with low female participation, has now overtaken the US.